What would the housewife of the 1960s do without that miracle can? It went into freakin’ EVERYTHING. I remember my Home Economics teacher extolling its virtues, and stressing that no husband would be happy if it was not kept in abundance in our future pantries. I really, really hated HomeIck. Almost as much as the stereotype that all I had to aspire to was being a wife, mother, and volunteer – all whilst cooking with Campbell’s Soup. So, of course, the first two recipes I copied out of Mom’s well-worn recipe box when I moved out were casseroles made with The Wonder Can. I did it because they are absolutely delicious. 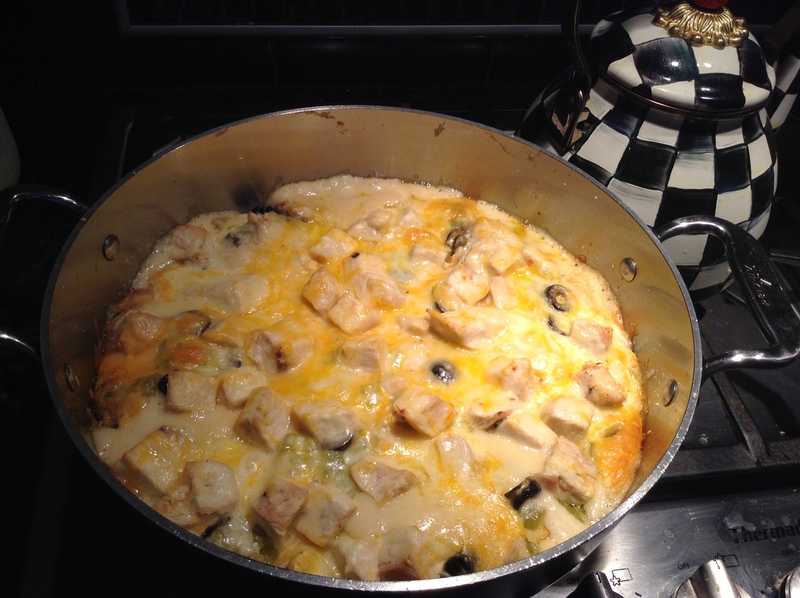 Chicken Tortilla was Mom’s go-to luncheon casserole when she hosted a Junior League meeting, or had the bridge group over. I have no idea where she got this recipe, but my brother and I used to love snacking on the leftovers when we got home from school. It became a dinner favorite, and my go-to for Junior League meetings where I drew the short straw on bringing the entree 20 years later. Even 50 years later. Tonight, I’ll be attending a planning meeting for the 50th Anniversary celebration for the Junior League of San Jose. The same League my mother joined in its first year. When I realized I was tapped for the entree, I thought it would be a most appropriate dish to prepare. Here’s the recipe, along with a few changes I’ve made over the years. If you don’t like mushrooms, swap out the mushroom soup for a second can of cream of chicken. I hope you enjoy this Taste of the Sixties as much as I do. Even with the Ubiquitous Wonder Can. Simmer chicken in salted water with onion and oregano or bay leaf for about 20 minutes, or until cooked through. Cool. Discard onion and water. Cut chicken into chunks and set aside. Slice the tortillas in 2 inch strips. Spray casserole dish or Dutch oven with vegetable oil spray of your choice. Mix soups and the milk together in a small bowl. Spread a thin layer of the soup mixture in the dish, and then a layer of cut tortillas. Sprinkle some of the green chilies and olives, and then add chicken and some of the cheese. Repeat with layers until all is used. My pan requires 3 layers, but yours may only need 2. Make sure the cheese is the last layer. I usually add a bit of mixed shredded cheese on top to add color. Bake at 350 degrees for 45 minutes, or until the cheese is browned and bubbly. Serves 6 normal eaters, or 8 Junior League Ladies. Don’t forget the green chili Cholula to serve with it. Pairs best with a very nice Pinot Noir. Or a margarita. Along with a nice slice of humble pie for dessert – if you, like me, ever vowed you’d NEVER cook with the Wonder Can. Posted in Recipes and tagged Casserole, cooking, easy dinner, recipes. Bookmark the permalink. I have several of my mother’s recipes that have a can of some type of Campbell’s soup in them. I haven’t made any of them for awhile, but you’ve inspired me to look them up. I might even try your chicken tortilla recipe. Maybe I can serve it to my husband while I’m wearing my high heels and pearls… Mad Men style. I think every mom had recipes with Campbell’s Soup. It was funny, after I posted this on Facebook, how many messages and comments I got from friends all over who had similar recipes. It must have originally come from Campbell’s. Regardless, it is a great recipe, and so yummy!